Decorating your child’s bedroom is often expensive, particularly if your little one has their heart set on a theme. You may want to create the perfectprincess bedroom for your little girl with no expense spared but usually there are budget limits to face. You might be hesitant to invest a fortune on a room theme that your little one will grow out of. The following tips will help you to create a princess room that your little girl will really adore, on a budget and will offer some insight on how to future proof your investment. Big items such as the furniture, will be the most costly part of your princess bedroom makeover. I suggest using white or indeed ivory/cream furniture, so that you have a neutral base and so that these furniture items can easily form the base for your child’s next theme or even for a funky tween or teenager’s bedroom. Themed furniture can be very expensive and also has a short lifespan. 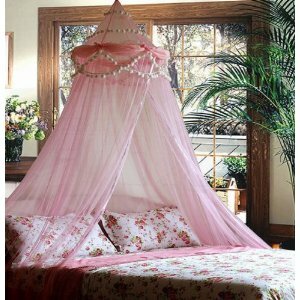 You can always add a pink canopy (like the one pictured above) to a simple white bed and voila you have a princess bed for your princess bedroom! Having themed murals painted can be very costly if you are not a skilled artist yourself. It will break your heart when you see it all painted over when the room is being reinvented. Using wall decals and stickers is a much simpler and cheaper way to achieve the look you want. Make sure that you get some that are easy to remove and don’t mark your walls – most don’t but just double check the description before you buy! These decals can cover a large space in your princess bedroom or accent a special area such as the space above the headboard. Check if you already have some items in your home that could fit with the theme for your princess bedroom. You might have some pink cushions or white drapes or some textiles that can be dyed to suit, for instance. Maybe you already have some white furniture or furniture that can be easily revamped with a lick of paint or some new princess door knobs. Your daughter may already own a collection of princess dolls and toys that can be placed on shelves or displayed to add to the princess bedroom theme. A princess dress or costume that can be framed or simply hung on a wall to add to the theme? These are just a few ideas for your princess bedroom but I think you get my drift. You can buy low priced bed linens, light fixtures, storage boxes etc that will create your theme for you. There is no need to spend a fortune on these items. If the items are functional and add to the princess bedroom theme, that is all you need them to do. If the princess accessories you choose can be easily adapted when the theme is changed then you really deserve some gold stars. You really can create a princess bedroom, without spending a fortune and without wasting money on expensive items that will have a very short life span. You can be assured that your own little princess with feel like she has her very own palace when you are finished.